Are you going to the beach this summer? With school starting in a few short weeks for some kids, families are rushing to get those last few trips in before summer vacation officially ends. While a trip to the beach is obviously a lot of fun for kids, it can also be stressful for adults who are trying to schedule vacation, take care of last minute errands, and make sure that everything is packed in time for the trip. If you are anything like me though, things are forgotten unless you make a checklist. I survive on checklists every day and have no clue what I would do without them! Hoping to make to make your next trip to the beach a bit easier, I thought I would share with you this amazing pool/beach checklist. 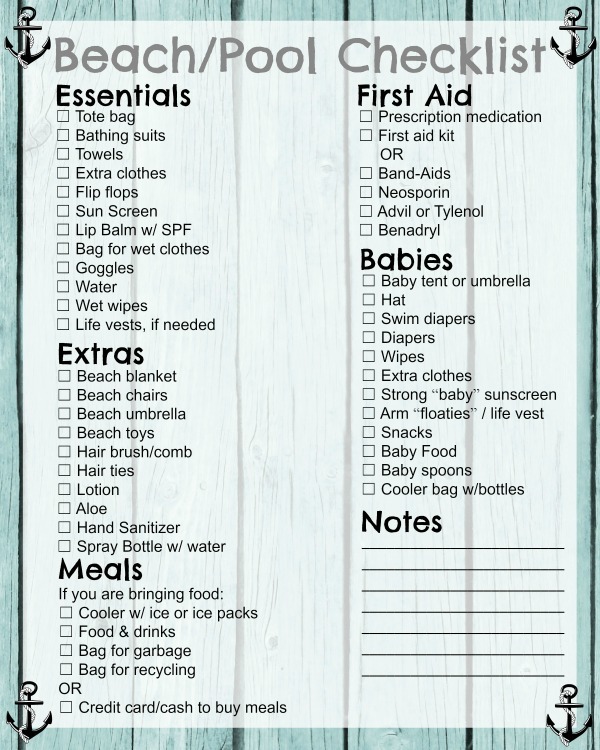 This free, printable checklist not only looks pretty, but includes everything you and your family need for the beach, making sure you aren’t missing anything important! Feel free to print this out as much as often as you need, or if you want a large version, feel free to click on the image to download a pdf version of this checklist for easy printing! I have this printed and in my bag – thanks!